It’s late 2002 and Epic Records, which distributes Clue’s Desert Storm, is throwing Envy a record listening party at the Sony building in midtown Manhattan. Clue’s in the house. His manager, Skane Dollar is, too. Envy considers both men his mentors. He’s learned well. He hollas his name over every track, a la Clue, so DJs don’t jack his ish. 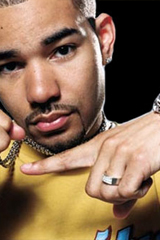 He’s formed his own production company, BLOK Entertainment, that has done beats for Ja Rule, DMX, Foxy Brown, the Def Squad, Funkmaster Flex, Irv Gotti’s Murderers, Fabolous and the flick “Exit Wounds.” They also produced four tracks on Blok Party Vol. 1: The Desert Storm Mixtape, and rep three artists, rappers Coke, XO and an R&B kid named Mike Charles. Plus Envy still finds time to push one mixtape a month, or between 12-20 a year. Fast forward to Monday, January 27, 2003. Envy and his manager Wonderful are packing their van for the next leg of their promo tour. Fresh from the barber shop, Envy is making one last stop at Sony to, among many other things, speak to this journalist. His answers are quick, to-the-point. Time’s a wasting. As if he would ever reveal his formula for success to anyone, I gamble, and ask for the magic behind his mojo. “How do you know a song’s hot?” Not a second skips before he responds: “If it makes your head bob, it’s hot. It’s just your ear.” Hmmm “Who’s next in terms of skills-not sales-to look for?” He pauses. “Joe Budden. And not because he’s a Desert Storm artist.” He shakes my hand. I bob my head. He bounces back to business. Holla back!